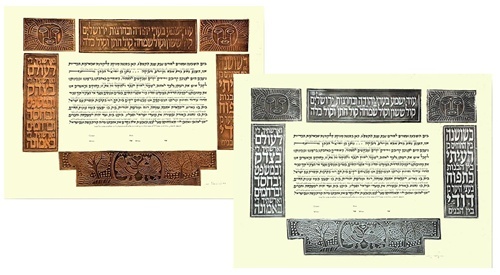 Silver Alloy or Copper On the left panel, in modern Hebrew typography embossed on metal, King Solomon's Song of Songs speaks lovingly of "my darling among maidens." On the right panel, a passage from the Book of Jeremiah promises "I will betroth you." These words of love are punctuated by proud peacocks and trees on the land -- symbols of beauty and prosperity. Right Panel: "and i will betroth you to me forever. I will betroth you with righteousness, with justice, with loving-kindness and with mercy. I will betroth you to me with faithfulness," Left Panel: "like a lily among thorns, so is my darling among the maidens. Like an apple tree among trees of the forest, so is my beloved among the youths." 20" x 15"